With an unbalanced gait, she limps to her wooden kitchen table and sits. 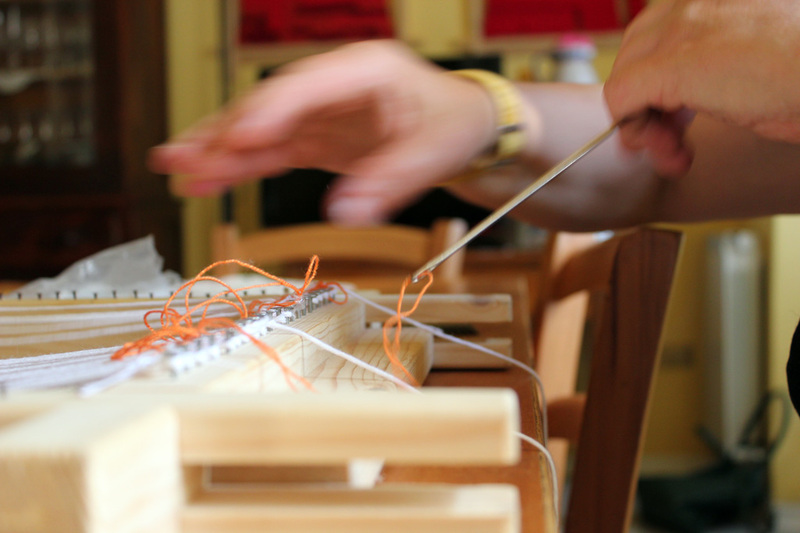 Her steady hand threads the oversized needle with thin orange yarn, which she then weaves through the strings on the handmade loom. Her outfit matches her jet-black hair. She wears a chunky necklace and – as if she forgot to put one on – only one earring. This is a visible sign of the memory loss that has afflicted Patrizia Palazzetti for the past 40 years. When she was 20 years old, not long after graduating from Cagli’s Istituto d’Arte G. Lapis, a gas canister explosion severely injured Patrizia. Sheremained in a coma for two months. 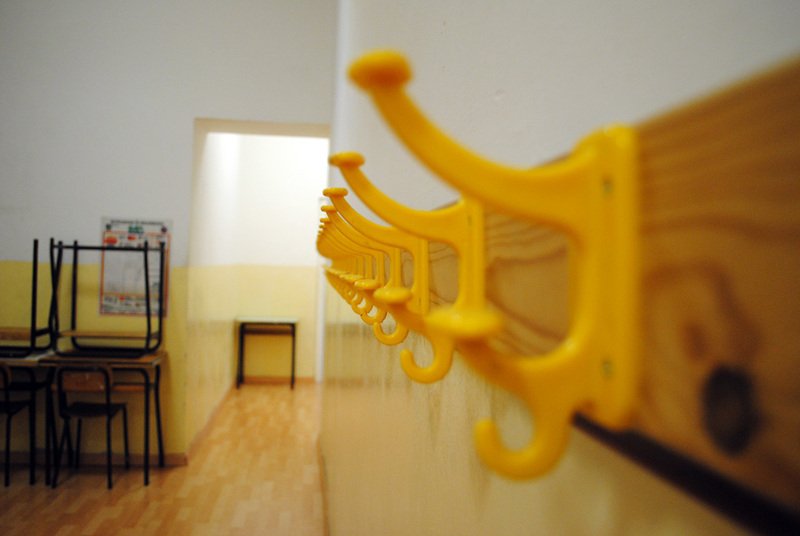 “When I woke up, it felt like I lost 20 years of my life,” she recounts. 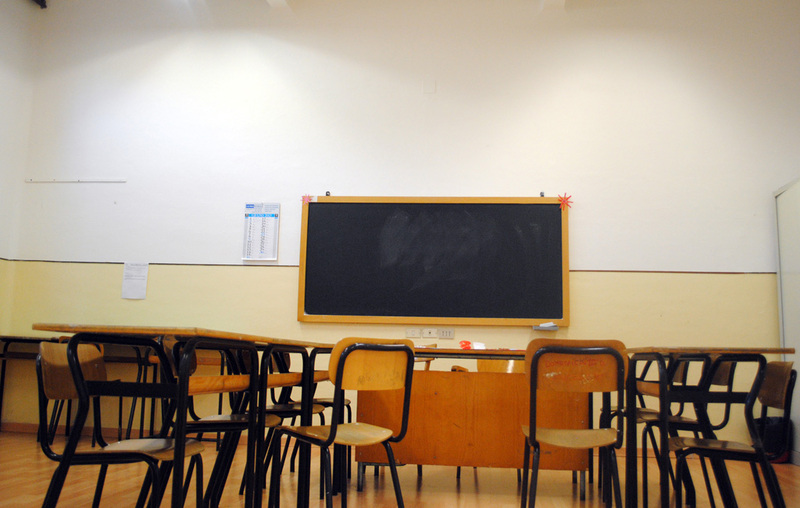 She did not know how to walk, talk, read, or write, and had to relearn the life skills most adults take for granted. 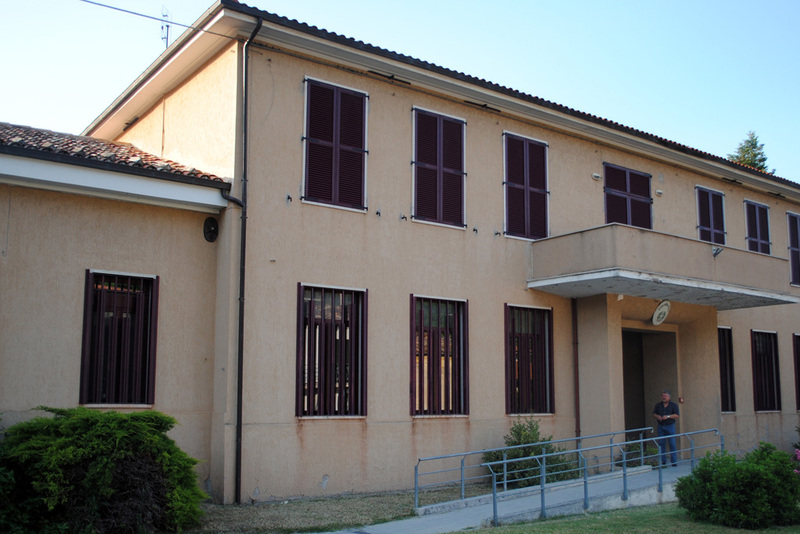 As part of her recovery, she attended a public school in Cagli where she studied with the local children. She then taught at the school until 1986, when she took early retirement and stayed home to raise her son. 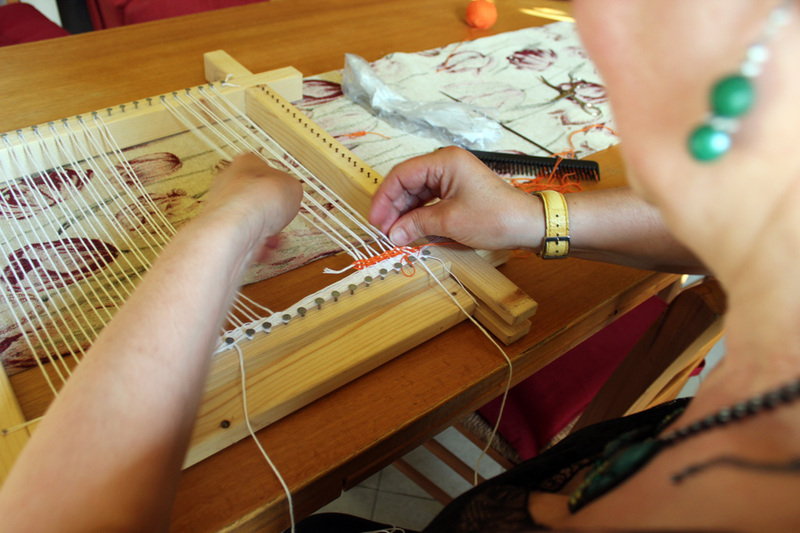 Then, about seven years ago, she was inspired to pick up her art again and began weaving, using techniques learned as a student at Istituto. 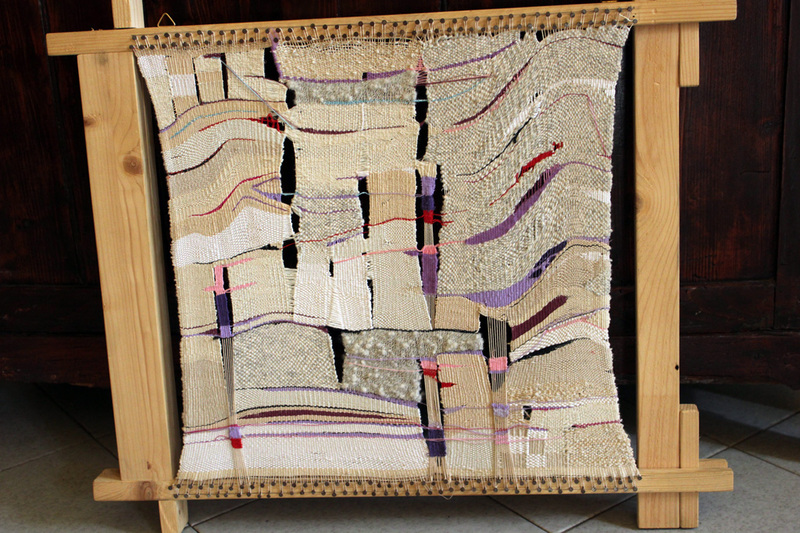 Patrizia says she started creating her art “to show my son I am capable of making beautiful things so my son could be proud of me.” While she does not remember the specific art-school classes she took in her teens, she says the act of weaving remains in her subconscious and her fingers. 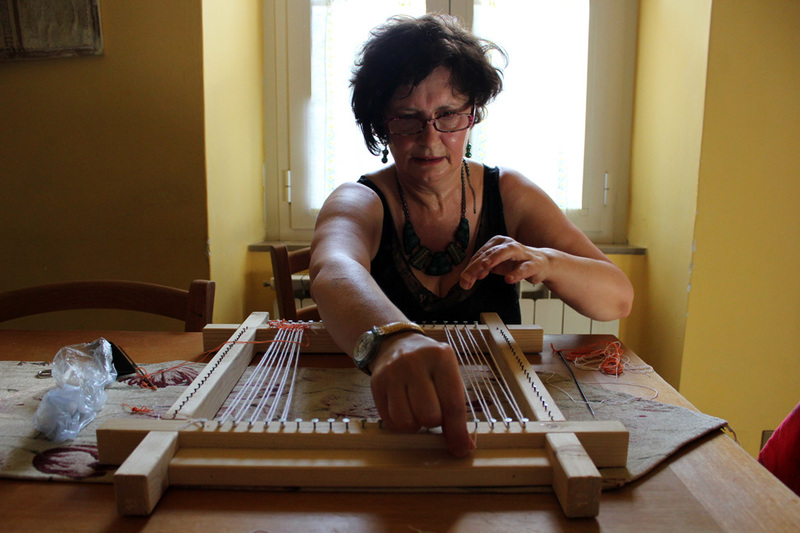 For many of her weavings, she uses a simple loom crafted by a Cagliese carpenter. The frame is studded with nails on which she strings thin yarn as the foundation for her creations. For the frames of other pieces, she reuses materials many would discard – old doors, windows, the bottoms of wine barrels. Patrizia’s most-recent find is a weathered tray with a metal, grid base that had been used to strain seeds and pulp from smashed grapes and tomatoes. She spotted the tray in the back of a truck and convinced the owner to sell it to her for one euro. When she is inspired to create or work on a new piece, Patrizia starts her day at 4 a.m. She clears off her kitchen table, lays down the loom, door, or other frame, turns on her compact stereo system to listen to her favorite music, and gets to work. She stays focused on the project until it is completed but takes breaks every 30 minutes or so to sit back and examine her work in progress. Anything that does not feel right is cut and redone. Her simple tools include a black hair comb, small scissors, long needles, and her dexterous fingers. For her weavings, she uses cotton and wool yarn, colored ribbon, and similar materials that she finds. She prefers undyed yarn. To add dimension to her weavings, she incorporates unpredictable items such as cinnamon sticks, old nails, bamboo, drinking straws, and rose stems from the garden behind her small apartment. She says she cannot create without music playing in the background. When she listens to music, she remembers every word to every song. The lyrics move her. However, Patrizia cannot remember what she reads or writes, a symptom of the brain damage from her accident so many years ago. Yet, this memory loss is not evident in her work. She proudly shows off booklets from her solo art exhibitions. 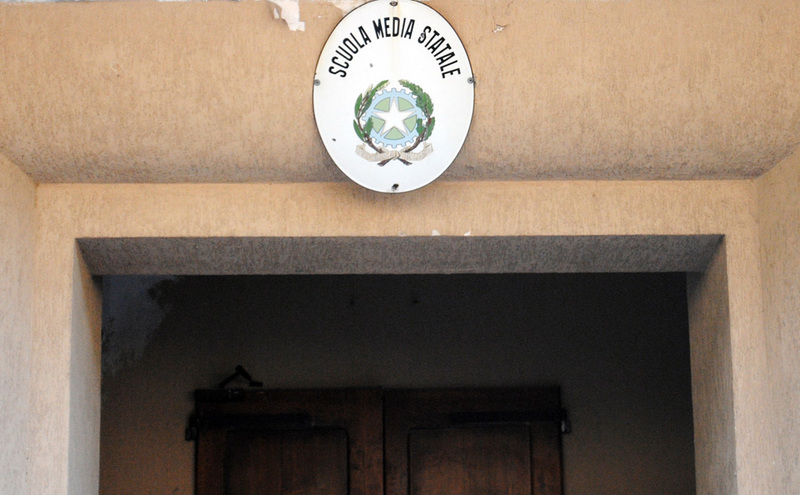 In 2006, she hosted a show in Cagli. A German tourist purchased 13 pieces that are currently on display at a Berlin factory. 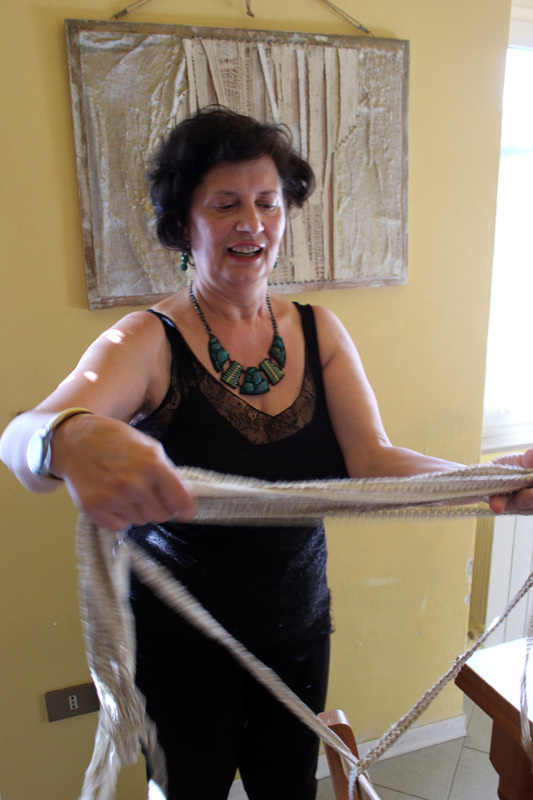 A few of her textiles hang on walls in Cagli, but Patrizia says most of the locals do not appreciate her style of art. 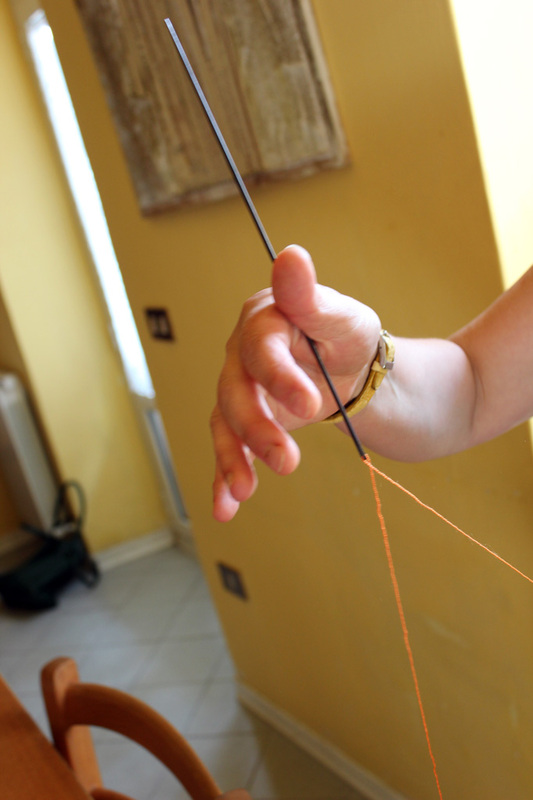 She calls her exhibitions “Tessere,” which means “to weave” in Italian. However, she incorporated a play on this word on the cover of the show booklets. The “T” in tessere is separated from the rest of the word. She explains that she was trying to stress the word essere or “to be.” Her art makes her complete, she says. 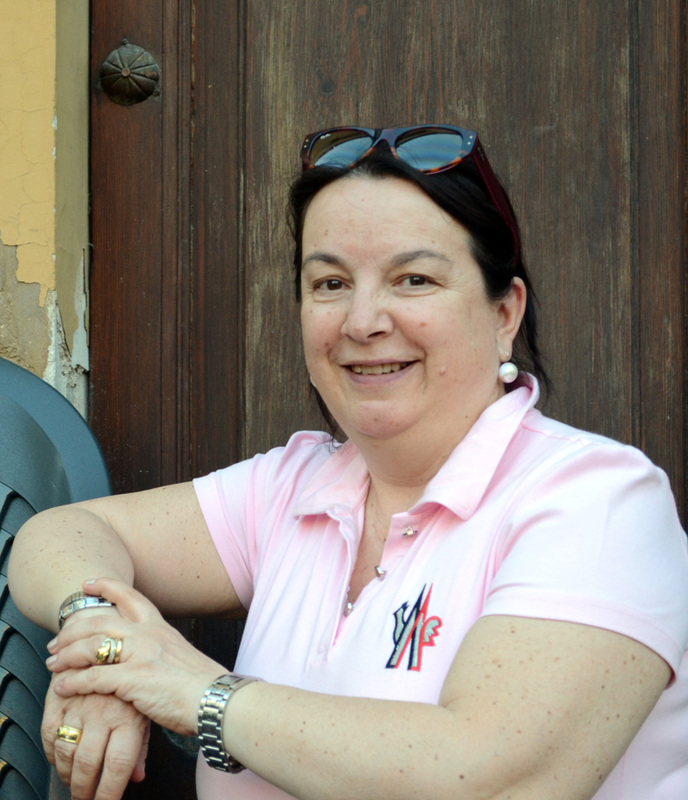 Patrizia is currently taking a break from her art as she looks for new inspiration. Her last finished piece – a three-dimensional abstract piece made of ecru yarn, gold thread, and gesso, a type of plaster mixed with glue – was completed in February. Even though she is not currently working on a piece, her art surrounds her, covering the walls and floor of her apartment. She says her best years are behind her, but she still lives for music, her son, and her art.